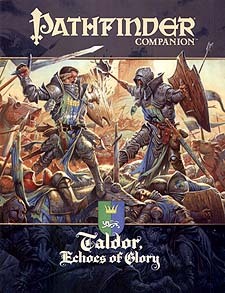 Knights, fair maidens, heroic adventures, and righteous quests - these are the legends of old Taldor. But the once powerful empire has fallen from its former glory. Now rival nobles battle each other with bitter knights and proxy armies for personal power rather than honour. A smoldering truce with Qadira again threatens to ignite into war, and Taldor's daughter states look down upon her with contempt. Yet there is still greatness in Taldor, a stone foundation under the flaking gold adornments. Sons and daughters of forgotten royal bloodlines hear change on the wind - but is it the whisper of greatness to come, or the death rattle of an empire long past its prime? This Pathfinder Companion describes the country of Taldor and its capital of Oppara. Become one of the Lion Blades, a secret agent prestige class for the empire! Learn the magic of the oppressed church of the Dawnflower! Rise to greatness from humble origins with new feats! Gain the ostentatious magic of Taldor's wealthy elite! Taldor needs champions - are you ready for the challenge?